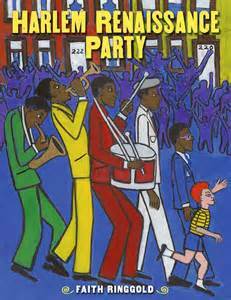 Harlem Renaissance Party, by Faith Ringold (Amistad, January 2015), is a somewhat didactic time travel book--a magic airplane (at least one assumes its magic) transports a young boy, Lonnie, and his uncle back in time to celebrate the Harlem Renaissance. The book basically introduces Lonnie to all the great writers, artists, and musicians, and then he goes home again. So not much actually happens that has story to it; there's no narrative tension--it's basically just the meetings and greetings and listing of accomplishments. In short, a celebration more than an adventure....time travel as learning opportunity for character and reader. Faith Ringold's art just doesn't work all that well for me, but that's a matter of personal taste (Lonnie on the cover doesn't look happy at all, for instance, which I feel he should!). If you want a celebratory introduction to the Harlem Renaissance, this might work well for you (back matter provides more information about the great people Lonnie meets); if you want time travel where the time travel is nuanced and complicated (which picture books are capable of), not so much.